When choosing drawing materials for the children, we should have two important things in our mind. First: strong pigments, and second: the age of a child. Children love strong, vibrant colors. Therefore, we should give them drawing materials with strong pigments. (Look at the difference on the picture: unhappy faces show the drawing materials with less pigment, happy faces show those that your children will love). We should avoid buying fluorescent colors, which are not natural colors. The younger the child is, the thicker the drawing material should be. The older the child, more the child wants to draw details and needs thinner pencils, markers or crayons. (See on the picture: from left to right). For the pencils, we recommend to choose a soft (B) pencil. At our workshops we usually use B2 pencils. Some colored pencils and crayons are water soluble, some not. Whichever you'll choose, keep those two things, that we mentioned above, in your mind. Instead of the crayons, we prefer to use oil pastels. They give a similar effect and (usually) have stronger pigments. Children should be taught to avoid using an eraser. They don't need it. As art is expressing ourselves, there's no place for erasers. The same goes for the rulers. However, a good sharpener is something we should have near by; we suggest a metal one. Try to color a piece of paper. If you have to press a lot to see a trace of a pencil, crayon or marker, then this is not the best material for your child. Your child will have to press even harder to get the same effect as you. When coloring or drawing, a child should fell relaxed and doesn't need to 'work hard' for the result. Although we're trying to avoid talking about brands of drawing materials and leave the decision to you, we'd like to say that Crayola materials are the worst we've worked with. Yes, they have cheap materials and yes, you get a whole bucket of markers for a little money, but it's not worth it. Not if you want that the children express themselves the way they need to. Buy the materials by yourself as children tend to want and 'like' something because of the pretty picture on the packaging, not because it's good for them. We'll talk about how to use drawing materials in one of the next posts. Do you have questions about drawing materials we didn't cover? Let us know in the comment section... Or read about choosing the right brushes in the previous post. 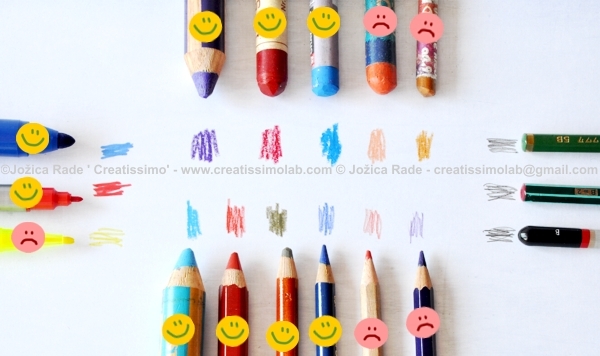 Posted on August 19, 2011 by Creatissimo - Jozica Rade and filed under children, creative lecture, education, how to..., materials and tagged color learning school montessori materials.